UNFILTER by Zynaptiq is a Virtual Effect Audio Plugin. It functions as a VST Plugin, an Audio Units Plugin, a VST 3 Plugin, an RTAS Plugin and an AAX Plugin. 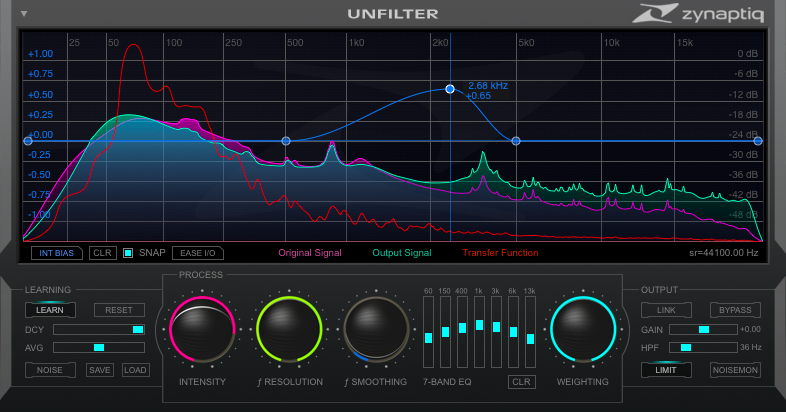 UNFILTER is a real-time plug-in that removes filtering effects, such as comb filtering, resonance, or excessive equalization – effectively linearizing the frequency response of a signal automatically.UNFILTER can also apply a detected filter response to another signal, or export it to disk as ann impulse response file (WAV), and can perform mastering grade adaptive, free-form, and graphic equalization. 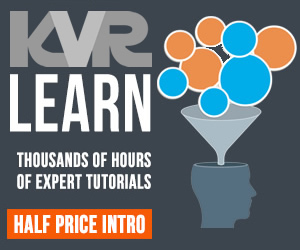 Applications include removing room resonance, repairing poorly mic'd production sound or musical recordings, enhancing the intelligibility of speech recordings in film sound, broadcast, ENG and forensics, adapting multiple sounds to blend better with each other, adaptively re-balancing the frequency response of mixed music, general purpose high resolution automatic equalization, and creatively designing new sounds. UNFILTER comes as AU, RTAS, AAX Native and VST on both Mac and Windows. A free trial is available from the Zynaptiq website.